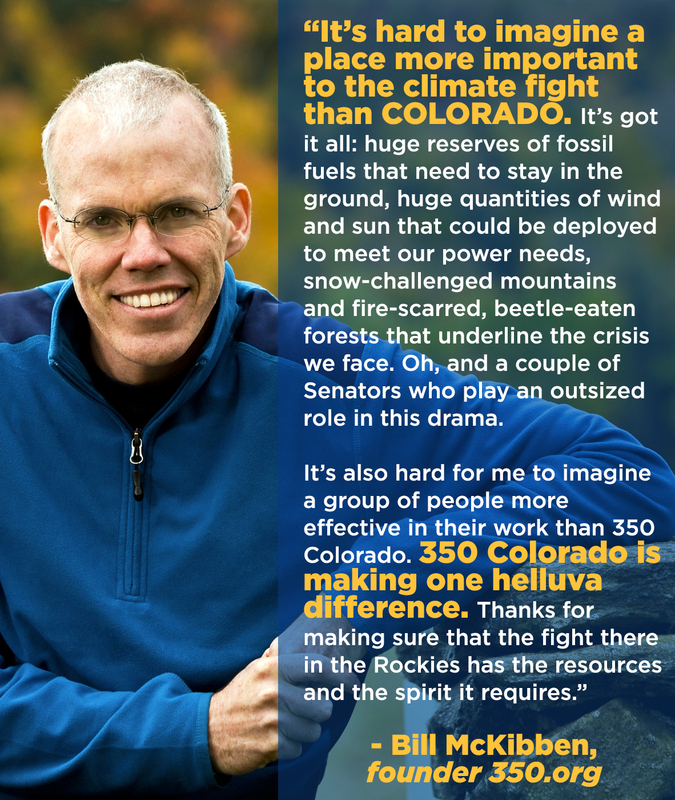 350 Colorado Springs works locally to help build the global grassroots movement to solve the climate crisis and transition to a sustainable future. Current Campaign: 350 Colorado Springs is working in coalition with The Sierra Club, Green Cities Coalition and many more to transition Colorado Springs municipally owned utility company from rolling coal in the heart of downtown Colorado Springs to 100% renewable energy by decommissioning the Martin Drake Coal Plant at the earliest possible date. Our team regularly participates in national and global 350.org sponsored events and we host dozens of local events each year that anyone can get involved in! This Spring there are many ways to get involved in the process to decommission the Martin Drake Coal fired Power Plant. We need to give public comments at this meeting. UPAC meetings are the first Wednesday of each month at 8 a.m. in the Blue River Board Room on the fifth floor of the South Tower in the Plaza of the Rockies (121 S. Tejon Street). All meetings are open to the public. Citizens are invited to comment during general discussion near the end of each meeting. The CAG is a group of citizens that apply and are chosen to participate formally and provide input in the EIRP process. Applications are expected to be made available this spring.We would like to see informed and passionate citizens in this advisory group. The Colorado Springs Utility Board meets every third Wednesday of the month at 1pm in the Blue River Board Room on the fifth floor of the South Tower in the Plaza of the Rockies (121 S. Tejon St) The board meets monthly to discuss utilities related policy and information. All meetings are open to the public. Citizens are invited to comment during public comments at the beginning of each meeting. The most important meeting of the EIRP process is Wednesday, 6/19 @ 1pm. This is one big last opportunity to provide public input on the EIRP process, including pushing for a meaningful public participation process, accurate pricing for renewables in the technical models, retirement of Drake with no new gas plants, and to bring community values to the table before the Board formally votes on the EIRP process. Then we’ll have to do all of this again throughout the actual EIRP process that goes through August 2020. Join the 350 Colorado Springs email list to get updates about our events by filling out your contact information at this link and select “Colorado Springs email list” to get the latest updates and events. Visit our Facebook Events page for our next meet-up and action. Generally, we host regular actions in the community and meetings with our coalition members. More information: How much are we paying to burn coal in Colorado Springs?